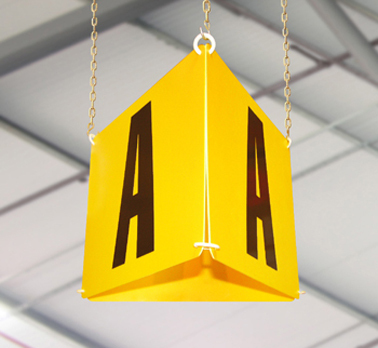 Our 3 way hanging markers allows clear all round identification for aisles and block stacking areas within the workplace. Our 3 way hanging markers allows clear all round identification for aisles and block stacking areas within the workplace. Price includes the printing of either 1 or 2 digits per side, Please specify digits required when ordering, can be alpha or numerical digits.The 2mm zinc plated chain is sold separately in 1m pieces complete with con hook (open large bow) at each end numerous lengths can be attached to each other to form the length required.